August 11, 3114 BC marks the beginning of the current calendric cycle of the Mayan Long Count calendar. The Mayan calendar is comprised of repeating periods that result from the Mayan base-20 positional number system. The Mayans were the first humans to invent a positional number system like our decimal system—a system based on powers of a number base plus the idea of a numeral that represents zero. A positional number system must have some way to represent the value zero. In contrast to our base-10 system, the Mayans chose base-20. So instead of decimal places Mayan numbers have vigesimal places. Instead of the decimal system of nine numerals plus zero, Mayan numbers are composed of 19 numerals, plus zero. In the decimal system, each digit represents a power of ten. In the Mayan system, each digit represents a power of 20. A positional number system is a necessity for doing serious mathematics. Imagine doing even simple addition with a non-positional system like Roman numerals. Our Gregorian calendar uses decimal numbers for years and a messy system based on the arbitrary values 7, 28, 29, 30, and 31 for weeks and months. We call the periods of our calendar days, weeks, months, years, decades, centuries, and millennia. The Mayan Long Count system is much cleaner. The periods correspond to vigesimal places of a Long Count date and are named k’in, uinal, tun, k’atun, baktun, piktun, etc., each representing a power of 20 except the the second place, the uinal, which is base-18. (This results in the 20×18 = 360 day count in the lowest two places to represent the 360 day Mayan year.) From the third place on up, the count is purely vigesimal. 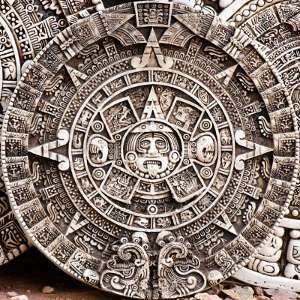 The Mayans actually used three calendars side-by-side. The Tzolkin and the Ha’ab calendars are designed to keep track of holidays and astronomical / planting cycles. Those calendars restart every 52 years and don’t concern us here. The third calendar, the Maya Long Count calendar, counts an unlimited number of days from a specified starting point using a modified base-20 system that accommodates the 360 day Mayan year. Because this calendar is unlimited, Long Count dates are inscribed in monuments intended to last for a long time. Now let’s connect some of the Mayan Long Count periods with real numbers. The first vigesimal place, the kin, counts 20 day cycles. The second place, the uinal, counts base-18. Together, the first and second places roll over every 360 days, which is the length of the Mayan year, and the count carries into the third digit. The third digit, tun, counts 20 Mayan years. The fourth digit, k’atun, counts 20 tuns, or 400 Mayan years, which is 394.25 years on our Gregorian calendar. It is this 394 year cycle that is going to roll over in December 20, 2012, and the next vigesimal place, the baktun, will increase from 12 to 13. We are now in the 13th baktun since the start of the Long Count calendar (like saying we’re in the 21st century in our calendar). The next baktun begins on December 21, 2012.
on 13.0.0.0.0 (Long Count) or Dec 21, 2010 (Gregorian). When 20 baktuns are completed (7,885 years from the starting point in 3114 BCE) a new piktun begins and the baktun starts counting again from zero. The pictun isn’t normally written on Long Count dates because it’s assumed. Just like we don’t write leading zeros on Gregorian years. We don’t write 000002012, just 2012. When 20 pictuns are completed, or 157,700 years, a new kalabtun begins. In fact there are two more digits defined beyond these in the Mayan Long Count Calendar, the k’inchiltun and the alautun. The Mayan Long Count calendar has places already define and named that carry it another 1.2 billion years. In our calendar we’re only named periods out to millennia. The Mayans had a much longer view of time. And even after 1.2 billion years have elapsed and the named periods of the Mayan calendar are filled, the calendar still doesn’t end. You just keep adding more digits to the year, the same as we will do when our year passes 9999. In light of this, the idea that the Mayan calendar ends is particularly ridiculous. The Long Count calendar is defined, with named periods, 1.2 billion years out into the future. It would make more sense to say that our calendar ends in 9999, since we haven’t named any periods beyond the millennium. But the hoopla about the new baktun (similar to a century on our calendar) makes for lots of book and movie sales. For a timeline of Guatemalan history, from 15,000 BC to the present, see Guatemala History Timeline.